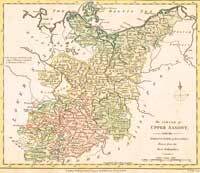 1794 Map of Upper Saxony Map – Fun Stuff for Genealogists, Inc.
We were so lucky to get this orginal map of Upper Saxony (Obersachsen). This was a name given to the majority of the German lands held by the House of Wetting, in what is now called Mitteldeutschland. From Wikipedia: "The name derives from when, after the fall of Duke Henry the Lion in 1180, the medieval Duchy of Saxony dissolved and the Saxe-Wittenberg lands passed to the House of Ascania and later to the Wettins in the Margraviate of Meissen. These dynasties subdued areas east of the Saale river inhabited by Polabian Slavs, and took the tribal name Sachsen (Saxons) upstream the Elbe with them. It was particularly interesting to distinguish the lands from 'Lower Saxony', a concept which arose later in popular usage (though never enforced) as a term for the original Saxon lands in north and west Germany (where West Low German dialects had spread), in what is now the state of Lower Saxony, as well as the adjacent Westphalian region, Holstein and the western part of today's Saxony-Anhalt north of the Harz range (Eastphalia). The Wettin lands up the Elbe formed anelectorate, which later headed the Upper Saxon Circle, acquired the Upper Lusatian region and finally was raised to a Kingdom. Thus the mid-German inhabitants of the German state of Saxony today are known as Saxons. This is true of the media, though the East Central German dialects of Upper Saxon (Meißenisch and Osterländisch) are placed in the the Thuringian-Upper Saxon continuum." So there, more than you ever wanted to know! All of our maps come in a protective, archivally safe sleeve. Measurements: Approximately 10-1/2" x 14". Sorry, maps are not returnable.